One of a kind, unique porcelain jewelry. You will find that my work has a contemporary feel with a touch of whimsy. I have necklaces, pendants, rings, earrings and bracelets for any budget. Made from porcelain and 22kt gold, sterling silver and 14kt gold fill. With my crackle, gold and dot collections, you'll find something for everyone. 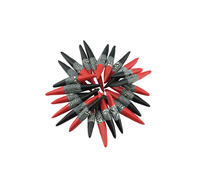 Hand made, one of a kind porcelain spikes in black, red and white. Set on stretch to fit most wrists. Comfortable, light weight and more durable than you would think. Comtemporary in styling, sopphisticated in feel and fun for the eye. Comes in 11 other colors. Hand made, one of a kind porcelain spikes set on a 16" sterling silver chain. Black satin and white crackle finish. Mordern and fun, light weight and durable. Comes in 11 other colors. One of a kind, hand made porcelain pieces set on sterling silver cuff. Adjustable to fit most. 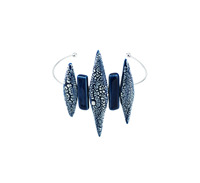 Blue and white crackle glaze give this piece sophistication and the shape gives a modern feel. Light weight and easy to wear. Comes in 11 other colors. Hand made, one of a kind porcelain chips set on sterling silver chain. 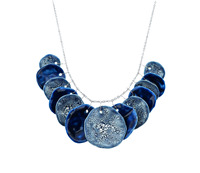 Blue and white crackle glazes were used in this piece but comes in 11 other colors. Very light weight and easy to wear. Chips can be reverserd to be a solid blue necklace. Hand made, one of a kind spike earrings. 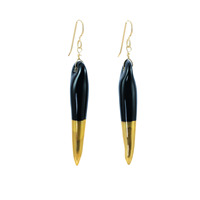 Shown in black patent and 22kt yellow gold with 14kt gold fill ear wires. Comes in small, medium, large, 11 other colors and 22kt white gold as well. Super light weight, easy to wear, and affordable. Modern feel with sophistication and edge. Hand made, one of a kind porcelain chips. 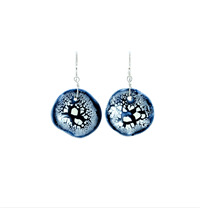 Shown in blue and white on sterling silver ear wires. Comes in 11 other colors and 3 sizes. Fun, light weight and easy to wear.